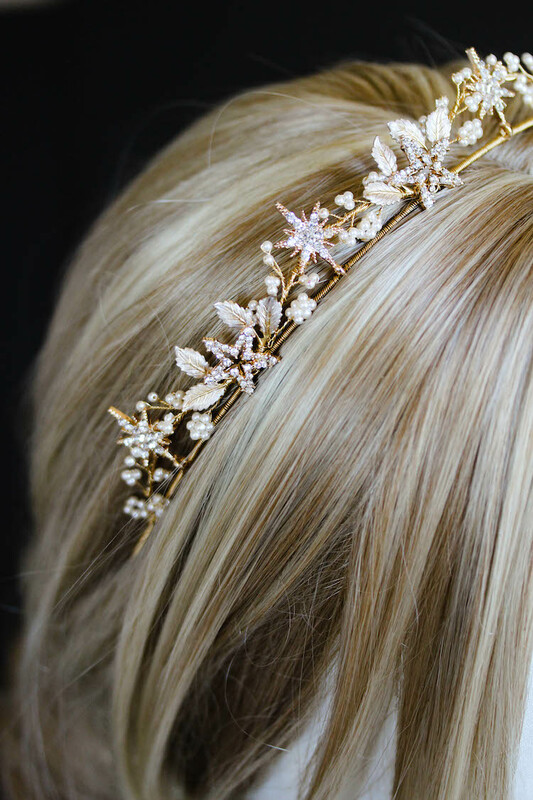 I’m a huge fan of a bridal headband – I like to think about them as a modern take on a traditional bridal tiara. I love them for many reasons but the main reasons are its versatility and they way it frames the face so beautifully. They can often be worn across the forehead or along the hair line, and they look just as beautiful in updos as they do in loose flowing curls. Just recently, I had the pleasure of working with bride-to-be Bonnie, to create a bespoke pearl and crystal headband in gold tones for her upcoming wedding. The piece Bonnie loved was the Laurel bridal headpiece and she wanted to wear it as simple headband to finish her bridal updo. I’m a little smitten with the end result… the glistening pearls, rhinestones and crystal beads are framed so beautifully by the gold plated jewellery wire. I designed the piece so it tapers off towards the back so it doesn’t add bulk under Bonnie’s hairstyle and it ties sweetly with an ivory satin ribbon. The Laurel headpiece has been a popular piece from my collection and I love working with brides to customise it to suit their vision and personal style. I particularly love this Laurel headband, the vine-like organic details of this piece offer the perfect combination of softness, femininity and formality. If you love this piece and would like something similar made, please feel free to get in touch! I would love to work with you to create the perfect piece.